Irresistibly, we all envision a salsa to be tropical, colorful, somewhat spicy, and so festive! With the right salsa recipe, it can be. There are so many kinds of salsa you can make. From the Mexican Salsa Roja or Salsa Verde, to the Southwestern Avocado-Grilled Corn-Chili, and the Caribbean inspired salsas with fruits like Papaya, Mango, and Coconut. 3. You can easily create your own without a recipe. Salsa is your chance to show off and impress. It’s your chance to make delicious, fat-torching foods everyone will love. When you think about it, a salsa is a colorful mix of diced vegetables and/or fruits. It starts with a “body.” That’s the main ingredient. It’s your “tomato” salsa. Or your “mango” salsa. Or your “corn and black bean” salsa. Then you need some “textural aromatics.” These should complement the body of your salsa — for instance, diced onions, cucumber, scallions, or chopped herbs. Finally, you need to salt that thing and give it a kick. It can be mild if you want to, but make sure it’s not plain and flat. A bit of cayenne pepper or chili oil goes a long way. Make sure you taste as you go. Also, remember that the ingredients in themselves don’t really matter. Just use whatever you and your family like, as long as it’s fat-burning and good for you. You see, in the video above, I decide to make a great, colorful, oh-so-healthy and delicious salsa with mango, avocado, red onion, and cilantro. I also add a bit of lime to perk things up, chili oil to give it a little kick, and a drizzle of avocado oil to bind it well. And I like to serve this on a beautiful grilled skirt steak, or a steamed fish. Yum! But I might as well make another kind, depending on my mood and what I’m serving it with. 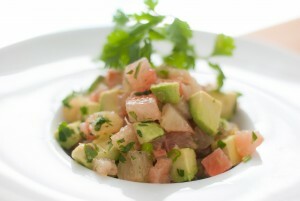 For instance, the salsa below was made with pomelo and avocado. 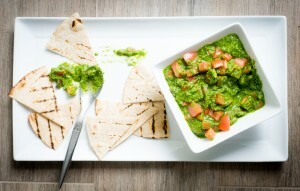 And this other one (Arugula Salsa Verde) I served with some grilled whole-grain tortilla as a snack. 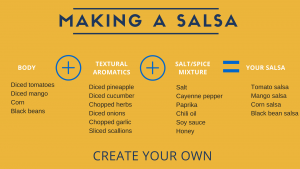 You see how simple it is to make your own good-for-you salsa that all your family will love? 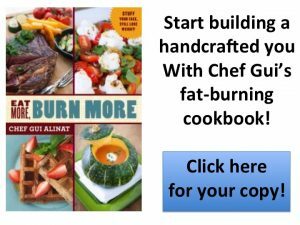 Let me know how you create your own and tell me how it turns out on the Eat More, Burn More Facebook page.